The mid-1990s were not a pleasant time for Marvel or its Amazing Spider-Man franchise. I’ve mentioned in the past that the Clone Saga really was a pivotal moment for me as a Spidey fan, in a negative sense. And when it was revealed, initially, that Ben Reilly was the REAL Spider-Man, it was enough of a groaner for me that I gave up buying comic books for more than six years. To this day, that still marks the longest I’ve ever gone without comics. The fact that this period coincided with the late stages of high school and early years of college, when I was incredibly distracted and impoverished (and having to pay some bills myself) is of course related, but don’t the “shocking” twists of the Clone Saga are still chiefly responsible for my Cold Turkey-era. With all that said, one of the somewhat fascinating elements of my big box of comics was that it contained a number of ASM issues that were published after I had temporarily stopped collecting. So I was able to go back and read these issues with fresh eyes, plus the added benefit of hindsight. Of course that was no guarantee that I would actually like what I missed. I won’t mince words. 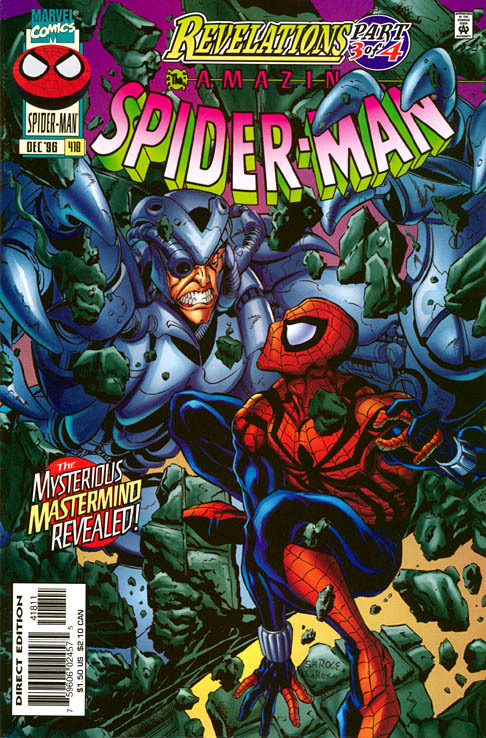 To this day, I still have an incredibly difficult time finding the redeeming qualities for the events of ASM #418. It’s a comic book retcon of the worst kind, changing one of Spider-Man’s sacred cows and setting of a wave of repercussions that are still being felt to this day. People like spout vitriol towards the events of “One More Day,” but I would argue that the return of long-dead Norman Osborn trumps Peter Parker’s deal with the devil that mystically dissolved his marriage to Mary Jane. One is a poor choice of characterization that ultimately undid something that probably needed to be undone anyway. The other was a complete revision of history done by a publisher that was more concentrated on being shocking than telling a logical story. When Norman shows up in a comic book today, whether it be as the Green Goblin or the Iron Patriot, I still have a hard time accepting he’s alive again. Maybe I’m just one of those old-fashioned fans that has a hard time letting go of the past. But there was finality to Norman’s death when it transpired in the pages of ASM #122 that read like it was a true watershed moment in the development of the series and the Spider-Man character. After killing off Peter’s love, Gwen Stacy one issue earlier in a moment that’s actually maintained its permanence in the Marvel universe, Osborn’s death was justice for the readers. Even though nobody had ever seen Spider-Man kill before, I think everybody reading that comic book knew that there was little chance that Norman could survive the coming retribution. He had crossed so far to the dark side, there was just no way to justifiably have him survive another day. And the fact the death blow came from his own glider, and not from Spider-Man himself, made it all the more poetic and … again, final. Peter had to live with the guilt of Norman’s death for years. And the ramifications of his death even led to new characters taking the mantle of glider riding from Norman, including his own son Harry. Then there was the Hobgoblin, who was introduced as a new and improved version of the Goblin family. Marvel was able to have its cake and eat too – perpetuate a popular arch-villain for Spider-Man, while simultaneously staying principled by not finding some cheesy loophole to resurrect Norman. He stayed dead for (in real time) more than 20 years because there was never a logical reason to bring him back. And if he was actually lurking in the shadows somewhere, why would he not show himself for more than 300 issues worth of continuity? Adding to the injustice of Norman’s resurrection is the fact that it was done to substantiate a storyline that had already traveled far past absurdity in its twist and turns. The issue opens with Peter’s clone, Ben Reilly as Spider-Man, and Peter in street clothes, meaning it was THAT point in Spidey’s history where Marvel thought it was a good idea to bait and switch its audience. 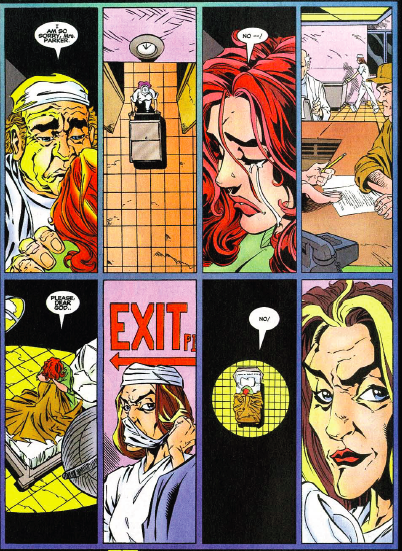 Mary Jane is pregnant and going into labor, which also means it’s that point in the character’s history where Marvel introduced every soap opera plot device possible to add melodrama to the story. Fortunately, it hadn’t yet be revealed that Aunt May was really still alive and that Norman had hired a body double on her deathbed in the otherwise beautiful ASM #400, but that was coming. Norman of course ended up being the mastermind of everything. He was the evil-doer behind the Clone Saga, not the Jackal. He poisoned Mary Jane so her child ended up being a stillborn. He killed Ben proving to Peter that he was the “real” Spider-Man. And of course that whole Aunt May thing. These are the kinds of plot twists and developments that make me embarrassed to admit I’m such an ardent comic book fan (too late for that. I write about it on a public blog two-to-three times a week). I can always tell when something I’ve read in a comic book goes “too far” when I’m telling it back to my wife and she sits there and gives me her “you sound like a crazy person” face. 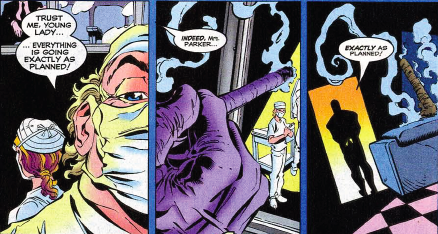 Say what you will about Dan Slott’s “twist” in ASM #700, but the whole body-switching thing is at least a remotely common device used in sci-fi story-telling. Faking your death for two decades and then announcing you’ve behind every single horrible, awful thing that’s happened to a superhero since your assumed death is something you hear about on a tacky soap opera. I’ve always held comic books to a higher standard than “General Hospital,” though perhaps that’s foolish of me. In the years that followed, Norman became a force in the Marvel universe again, even inserting himself in the heart of a battle with Earth’s mightiest heroes. It’s been nearly 15 years since ASM #418 so I guess I have to get over what happened here, but I still go into a bit of a rage every time I reread it (which was the case earlier this week when I reread it in anticipation of this post). I’ll admit, I must be softening a bit, because I had a moment of “almost” joy when the Goblin appeared on the last panel of Superior Spider-Man #4. But that had more to do with viewing the confrontation through the unique lens of Doc Ock as Peter (as Spider-Man). I do think there’s potential in that story if done right, but that’s just mean moving on to the “acceptance” stage of my 12 step program. When I’m thinking about this during any of the 11 earlier stages, I still can’t believe that there’s a Norman Osborn out there to be confronting any version of Spider-Man in 2013. I personally have no problem that they brought back Norman . His death was dumb as hell in the Gwen Stacy’s arc (seriously , the Goblin KNEW that Spider-Man has spider-sense, why would he do such a stupid trick ?!! ), and he’s a cool villain, so why Marvel should have prevented themselves to bring him back to the scene ? Moreover Harry Osborn was dead, Macendale butchered the Goblin legacy, therefore we needed a worthy Goblin back . Sure there could have been better time, and it doesn’t excuse the mess that was the Clone Saga, but hey , Osborn is my favorite , and when he came back, he killed both Peter’s baby and the man he considered as his brother . Good for me . 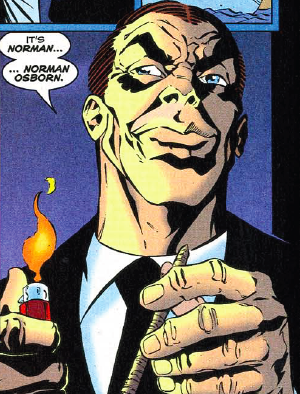 Yes Osborn knew Peter was Spider-Man but that doesnt excuse his insanity and bloodthirst for Parker’s blood. That “final” battle between the two of them as gripping because you had no idea what was going to happen. Parker was so driven to end the Goblin’s life fueled on adreniline and rage, while the Goblin simply was driven insane by past failures thanks to Spider-Man and frankly grown paranoid. This wasn’t going to be the fights of the past where Gobby had the upper hand thanks to his tech or the gangs he tried to control with Parker’s ingenuity to save himself in the end. No this was an all out duel where character motivations were compromised with that of brute force.